Los Angeles, CA – September 28, 2016 – (GuitarPR) – Six String Logic LLC, in partnership with TedGreene.com has announced the release of the brand new Trail Guide to Chord Chemistry, Your Essential Road Map to Understanding Ted Greene’s Book by Leon White. The 32-page eBook is available free directly from TedGreene.com, the Official Archive Site for the Legendary Guitarist. The Trail Guide is designed to help guitar players get more out of Ted’s most famous book, Chord Chemistry. It contains descriptions of each chapter (section), analysis of how to use the book and suggested “trails” through the book. It also includes a grid version of one of the chord melody examples and selected photos of some of Ted’s less well-known guitars from the author’s private photo collection. 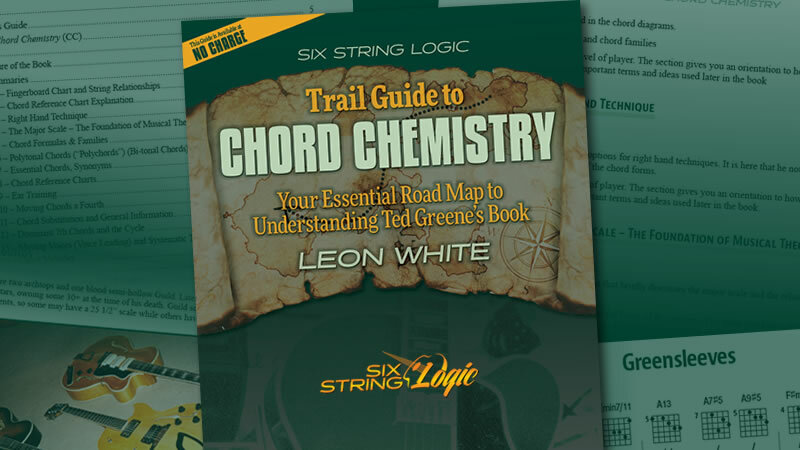 The Trail Guide to Chord Chemistry was released in commemoration of Ted’s birthday (September 26) and can be downloaded at: http://tedgreene.com/trailguides.asp. After Ted’s untimely passing in 2005, TedGreene.com was created to preserve his large body of work for today’s musicians and generations to come. The site has operated for nearly 11 years, supported solely by contributions from friends and fans of Ted around the world. Get more information on support at: http://tedgreene.com/contribute.asp. Six String Logic LLC is a new publishing and education company focused primarily on guitar and guitar-related business. During the fourth quarter, they will be releasing a variety of new educational materials for guitar, including original chord melody arrangements. They include multiple videos, unique chord charts, and a new approach to learning solo guitar chord melody. Watch a video preview at: http://sixstringlogic.com.